Here’s a piece of art by Matthew Cordell from our upcoming picture book, Mighty Casey (March, Feiwel & Friends). 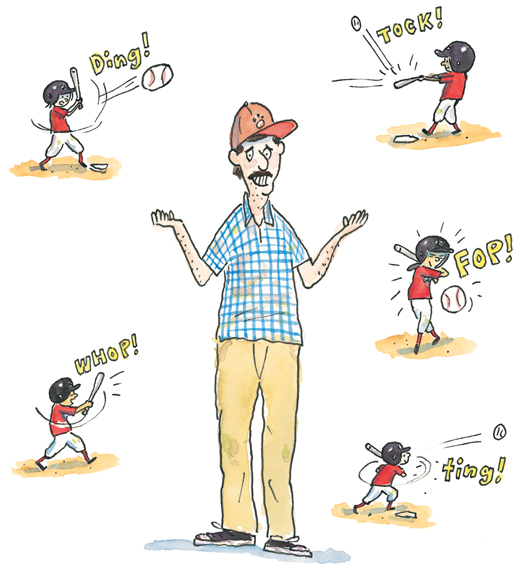 It’s a rhyming story inspired by Ernest Thayer’s “Casey At the Bat,” borrowing the classic poem’s rhythm and cadence, but relocated to a pee-wee Little League team that can’t do anything right. Matthew’s comic illustrations make it all work. In my opinion, he’s a huge talent — with a great sensibility — just beginning to tap into his potential. If he were available on the New York Stock Exchange, I’d be all in. Ah, to be young and so full of promise. I wanted to share this piece because I identify with the somewhat bedraggled Coach Lapinski. I’ve spent much of the past three weeks coaching thirteen boys on an eight-year-old All-Star team. We played nine games in two tournaments; over a stretch of twenty-four days, we practiced or played games on eighteen days. During the open days, it rained . . . or I tried to cut my lawn . . . or tried to reacquaint myself with my enduring wife, Lisa. But still: A great time was had by all. And yes, I’m glad it’s over. Back to Matthew: He’s got a cool blog — such a friendly tone to it, with openness, wit, and charm. Actually, come to think of it, I’m afraid I have a Man Crush on the guy! Oh, yeah: I love the sound effects that Matthew drew into the illustration. Tock! Fop! Ting! It reminds me of a childhod favorite from Mad Magazine, the singular Don Martin. His illustrations always had the greatest sounds. Frak! Boimp!